“This is the worst,” Ed Gor, a Houston resident, told me on our podcast, Emil Amok’s Takeout. We were on the phone Sunday talking about the power of Harvey, demoted from hurricane to tropical storm, but still packing a wallop. Gor knows he was lucky for now. 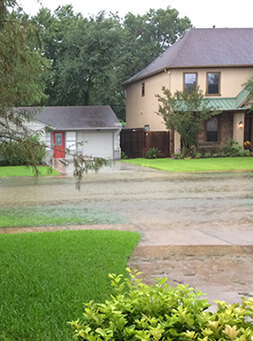 His street was flooded, but the water was still a few feet from his front door. But with more rain in the forecast, he wasn’t sure how Harvey would end for him. 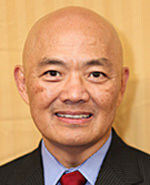 Gor is the president of Chinese American Citizens Alliance, formed in 1895 and the oldest Asian American civil rights organization in the country. This week, he was wondering how he would get to his organization’s 54th Biennial National Convention in Chicago. In the podcast, he talks about the vast Houston Chinatown and how it may be affected by Harvey. He also said because the community is spread throughout Houston, it’s hard to gauge how Asian Americans will be impacted. He said senior citizens would suffer the most. On the positive side, Gor said he’s seen the storm bring out the best in people. Houston is going to need a lot of that in the weeks to come. I asked him if he thought the president has done enough. At the time I called, the president had made a few perfunctory tweets. But nothing that expressed any concern for the human toll that was taking place in real time. Nothing to indicate Trump really knew how the presidency works to help us all as a nation during a massive natural disaster. Trump did, however, see it fit to tweet/plug a friend’s book, mention something about a trip to Missouri, and tweet more on his border wall. There were tweets about meetings and FEMA. But nothing to indicate he really gave a hoot for the people struggling with Harvey. You’d expect that from a leader. No matter what party. But after Charlottesville, we should know we don’t have that kind of leader. We have a me-first leader who elevates the neo-Nazis and white supremacists among his base nationalistic support. How else to explain his “both sides” and “many fine people” talk? We know how Trump explains it all. In Phoenix, he purposefully misrepresented what he said to his followers. And the media manipulation doesn’t end there. With Harvey’s encroachment on Texas, we have a leader who used that news to shield the dumping of more significant negative news on the country when all attention should have been focused on the storm. Maybe his should have too. But is there any better time to formalize a discriminatory transgender ban in the military? And it’s probably the best time to unveil the polarizing announcement of his pardon of Arizona Sheriff Joe Arpaio–who was convicted of illegally racially profiling Latinos. Is there any doubt what our divider-in-chief represents? He likes pre-1965 America. Pre-civil rights America, when our country was not so diverse. And despite his preference to be president for only some of us, we’ve come to expect a president to offer something to show concern and lift the spirits of all those suffering in Texas. Something more significant than a 140 character tweet. That’s what a leader is supposed to do. I used to live in Houston. I’d say I did a fair amount of my growing up there as a nineteen-year-old announcer at the major rock station of the time, KLOL. I remember reading flash flood warnings from the wires during times like these. And then not heeding the warnings, I drove onto a flooded street in my low-riding car. I know the pain of Houston floods. The memories came back as I watched the news dispatches from Texas. Water, water everywhere. And the damage is unfathomable. Heartbreaking. 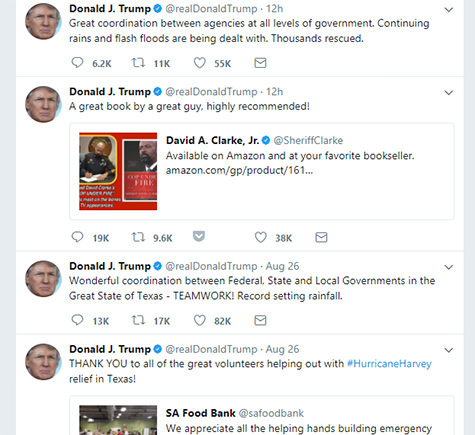 The only thing missing is a president offering empathy and comfort for everyone touched by Harvey. If only we had that kind of president. Listen to my podcast with Ed Gor here.